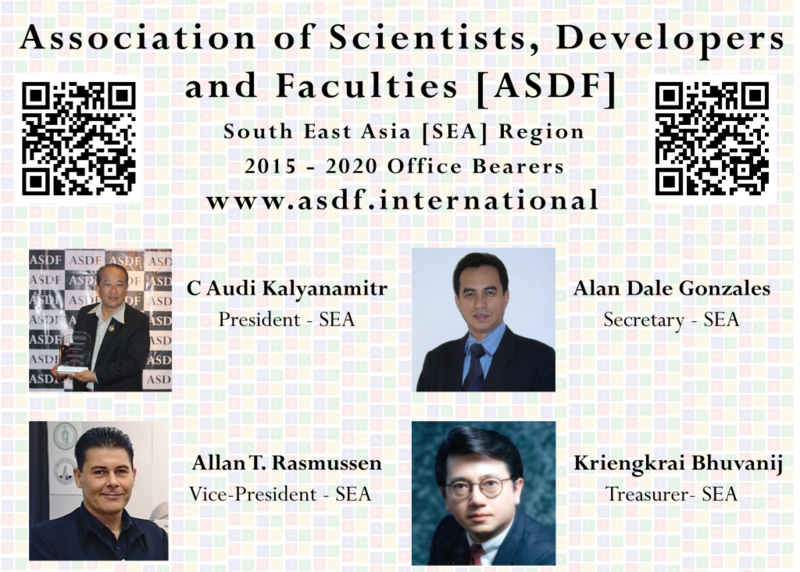 News in NutShell : ASDF Headquarters has now announced the new set of Office Bearers for South East Asia Region which will be headed by Audi Kalayanamitr from 2015 to 2020. Officially announced by the ASDF International President and directed by International Secretary. News in Detail : Association of Scientists, Developers and Faculties incepted in 2010 has now landed in South East Asia region with full fledge from January 2015. The Governing Council under the leadership of visionary leader Pr. Dr. Anbuoli Parthasarathy has unanimously selected the office bearers of ASDF SEA Region which has got resolved in the board with fullest support. The span of the office bearers from 2015 to 2020 of the South East Asia Region will be headed by Dr. Chieanchuang Audi Kalayanamitr who is an industrialist marking his successful operation in Thailand and South East Asian Countries. This SEA Region consists of all the South East Asian countries including Brunei, Cambodia, East Timor, Indonesia, Laos, Malaysia, Myanmar, Philippines, Singapore, Thailand and Vietnam into its domicile. The International Secretary Kokula Krishna Hari Kunasekaran has delegated his powers of signing the University and Academic Institutes Memorandum of Understandings to the SEA Region Secretary Alan Dale Gonzales which needs to witness by the SEA Region President Dr. Chieanchuang Audi Kalayanamitr. The President of ASDF SEA Region for the tenure 2015 to 2020 Dr. Chieanchuang Audi Kalayanamitr is presently the council member at NRCT (National Research Council of Thailand) and Member of NBTC (National Broadcast and Telecommunication Commission) of Kingdom of Thailand. Asides he is the Chairman of 5G / Wi-Max Implementation. He is the Senior Advisor on National Science Council and Prime Minister’s office of Laos. He has his own role in the Patent Partners too. The Vice-President of ASDF SEA Region for the tenure 2015 to 2020 Allan T Rasmussen possess Extensive experience and accomplishment in Telecom, Broadcasting and IT – with a solid combination of passion, strategic business planning, development and execution, high technology skills, combined with a creative, out-going personality. Committee Member of Thailand’s Set-Top Box Standard Committee, The Engineering Institute of Thailand under H.M. The King’s Patronage. He is also the Committee Member of Computer Engineering Committee, The Engineering Institute of Thailand Under H.M. The King’s Patronage. He is also the Managing Director of Yozzo Co., Ltd., Thailand. The Secretary of ASDF SEA Region for the tenure 2015 to 2020 Alan Dale Gonzales has over 20 years of experience as a consultant specialized in project development, management & financing with particular focus on energy & environment projects. He has extensive experience in providing advisory to government agencies, private enterprises & international institutions such as the European Commission, World Bank, IFC, ADB, & UN agencies. He is presently the CEO of WADE, Kingdom of Thailand. The Treasurer of ASDF SEA Region for the tenure 2015 to 2020 Mr. Kriengkrai Bhuvanij, IBM Thailand was also a Governor of the Board of the American Chamber of Commerce of Thailand. He is an executive member of the Joint Foreign Chamber of Commerce of Thailand ICT Committee, the Board of Trade of Thailand Service Business Committee, the Service Science Management and Engineering Steering Committee of Thailand, the National Technical Standards Committee of Thailand, the Engineering Institute of Thailand under the King’s Patronage, Executive Advisor of the Association of Thailand ICT Industry and Executive Committee, Computer Committee of Engineering Institute of Thailand under the King’s Patronage. The new council has decided to concentrate on University and Government partnerships in establishing Joint Research Activities across the region. ASDF SEA would like to give a thrust to research activities across the region by taking up various research studies in all the areas. ASDF SEA will also undertake activities to encourage research and innovation within the industry and well as in academia / University. While initiation of ASDF SEA Leadership Series will facilitate exclusive interaction between the members of ASDF and industry leaders, at State / National / International level and in turn, provide a platform for exchange of experience and technical know-how, various events will enable the members to get acquainted with the future directions, trends, opportunities and learning across key sectors through lectures by some national & international industry stalwarts. Apart from that a series of learning and development events will also be organized for the senior leadership team of ASDF HQ & SEA members such as CFOs / Finance Heads, CMOs / Marketing Heads, HR Heads, CIOs / CTOs / Technology Heads and other key functional heads of the organization.